T-Base Pro for data exchange, remote control, test automation and more! Raytech’s T-Base Pro is a powerful set of tools for data exchange, remote control, visual measurement data analysis, test automation, and much more. It comes with a fully integrated database management system for storing measurement data as well as with a fully customizable reporting system which can generate test reports in the most widely used document formats. It uses an advanced add-on ecosystem which makes it suitable for integration with external systems. Data Management: Create and save measurement profiles and templates. 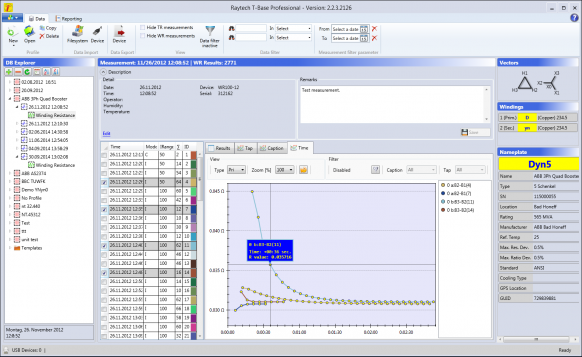 Save and manage your measurement results. Import and export data. Save and print reports. Visualize, inspect, and compare measurement results. Remote Control: Import and export profiles and results using USB and serial interface. Use your PC as a full remote controller for single or multiple devices and set ups. Save complex ATOS setups. Multitasking capabilities. Measurement: Create and save custom measurement workflows. Let T-Base inform you about measurement progress or errors. Program and edit custom workflows using a intuitive graphical interface. Save and exchange workflows. Expandability: Extend and customize the application according to your needs using our rich APIs interface and MS Visual Studio templates. Make T-Base a part of your environment or write control interface for third-party devices. Reporting: Export and save your measurement results in many popular formats like Microsoft XPS (Windows document) and XLS (Excel document), Adobe PDF, or simple HTML. Database: Use preconfigured, embedded SQL database or database on network share, Microsoft SQL Express and SQL Professional versions. User Interface: Modern, graphic user interface that is not only highly functional, it is also a pleasure to use. Technology: For the development of our software products, we are using the latest technologies provided by Microsoft. Please note that these downloads will redirect you from the Raytech USA to the Raytech Switzerland website.